Since it is already the weekend, you know that you want to just unwind and not have anything to do with work. After all, doesn’t the old saying go, all work and no play makes Jack a dull boy? You surely do not want to end up jaded when Monday rolls around, so why not throw a crazy pool party with the rest of your mates? 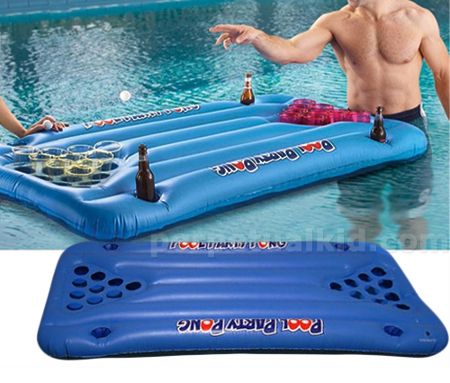 The $38.99 Pool Party Pong will be able to merge the passion of pool parties and craziness of beer pong, as this playing table can be inflated to 5 feet long, and can be set up for both 10 and 6 cup beer pong, sporting an additional quartet of cup holders for wash cups, or perhaps to cater for a particularly thirsty player. Needless to say, I would expect the Pool Party Pong to be made up of quality material which will not puncture all too easily. There is also the attractive fact that the entire setup can be stashed away in a jiffy once you are done – after all, how hard is it to deflate something this size and to fold it up afterwards? There you go, attaboy!